Introduction: Have you ever wondered how Luke gathered material for his gospel? What if Luke did research to prepare his story of the birth of Jesus? Do you think Luke interviewed people with first-hand experience? 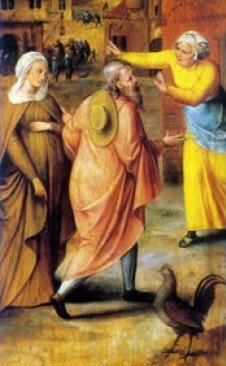 Perhaps, Luke conducted an interview with the innkeeper who took in Mary and Joseph so many years before. Luke: I am thinking of gathering as many stories as possible about Jesus and writing them down. I have been fortunate to talk with Jesus’ mother, Mary, and she suggested that I talk with you to learn about Jesus’ birth. Can you tell me about yourself? Hannah: I have a small house in Bethlehem. There is a stable at back. My husband and I ran the Inn until his death. Luke: I understand that Jesus was born following the decree from Caesar Augustus that everyone should be registered. So, Joseph went back to his ancestral hometown, Bethlehem. What do you remember about those days? Hannah: It was a very busy time with lots of people coming and going. Many people needed a place to stay. I was swamped, and what I thought would be a fun adventure became a lot of work. Luke: What do you remember about Mary and Joseph? What did you think about them? Hannah: I saw Mary and Joseph, and I was sorry to tell them that I had no room. They had travelled eighty miles, which is a long way. I felt great sympathy for them, but I had no room. I knew they really needed a place to be. Luke: What did you do? Ask other people to leave? Luke: As I was talking with Mary for information on the story I am gathering, she said, “Be sure to ask Hannah about the shepherds.” Will you tell me about shepherds? Hannah: I heard a commotion from the stable, and I saw shepherds. They started telling me a story that was hard to believe. And, to be honest, I was very skeptical. Luke: I know that shepherds have a rough reputation. What did they tell you? Hannah: The talked about angels visiting them, announcing that the Messiah had been born, singing to them, and offering great praise. Luke: Did you believe the shepherds? Hannah: As I said, it was hard to believe. But after the shepherds told me about their visit from the angels, Mary and Joseph told me about their own experience with angels. So, the stories were confirmed. I believed that Jesus was the Messiah sent from God. And, I still believe that. Luke: Thank you for these wonderful details. I do think I will write them down. This entry was posted in Sermons, Uncategorized on December 20, 2012 by Dean Allen. Preacher One: Do you remember playing games as a child? Preacher Two: Yes, I loved playing games with friends. One: Do you remember playing games with do-overs? Two: Sure, do-overs are second chances. When you mess up, or things don’t work out as you had hoped, you can call “Do-over” and have another try. One: Did you ever play a game when do-overs were not allowed? One: I remember one day when I was the newest child in the neighborhood, and I was about to play my first ball game there. I was the first person to take a turn that day, and just before I began, other children yelled, “No do-overs!” I still remember the chill down my spine, the lump in my throat, and the pit in my stomach. “What if I mess up?,” I thought. “What if I fail?” I was almost frozen in fear. One: That would have been great. Two: Do-overs have an amazing ability to free us from fear, to help us overcome a sometimes paralyzing dread of failure, and to lead us to action. One: Do-overs are like the net under a trapeze that encourages the trapeze artist to try something new, to venture beyond what she is comfortable with, to attempt an extra flip or special task. Even if she fails in her initial attempts, the trapeze artist knows the net is below, and it will catch her. And, she can try again. Two: When there are no do-overs, however, fear of failure can lead to inaction and can cause people to stay with what they know, to remain with the comfortable, to refrain from venturing into new tasks or possibilities. One: With that view, most people refuse to take risks, preferring a safe route that holds onto security and safety. Two: Jesus offers a fascinating parable about taking risks in service to God’s reign. In the parable of the talents, a master entrusts vast sums of money with his servants. We often hear the word “talent” and think of our abilities, but a talent was money – and lots of it. A talent was worth about 6,000 denarii, a day’s wage for an ordinary person, and it equaled about twenty years worth of wages. With the first servant, the master entrusts five talents or 100 years of wages. With the second servant, forty years of wages. And, with the third servant, twenty years of wages. One: When Jesus taught with parables, he often used hyperbole to emphasize a point. In this case, there seems to be an exaggerated amount of money left with servants. What point could Jesus be making? One: So, Jesus surprised his listeners with a story of a master giving enormous sums of money to his servants. Is there anything else surprising in this parable? Two: Yes, the hearers would have been surprised by the third servant’s fear-filled response to his master. “I knew you were harsh, and I was afraid.” How could someone think a master harsh when that master just entrusted such a huge sum of money with him? One: Also, it seems the hearers would have been surprised that the third servant did not try to do something with the money. After all, it was twenty years of wages. If someone is down to a few pennies, she might not be willing to take risks, but if that person has $1 million, surely there is room for some risk-taking. One: I have heard this parable used in churches for the annual stewardship campaign. Is it teaching Jesus’ followers to give their money for God’s work? Two: No, money is used to illustrate a larger point. The meaning is much deeper than money. Jesus is not simply teaching us to use our money to make more money, and he is not telling us to give our money to God for God’s work. Rather, Jesus is teaching his disciples – then and now – to use the resources we have been given, to take risks with what we have and help it become more, to see possessions not as treasures to be hoarded but as opportunities to be invested into something much greater. One: What is the message for the church? Two: So often, churches miss opportunities to engage in mission where they are located because their attention is focused on their balance sheet, income statement, or membership numbers. Churches list their assets and liabilities, and they seek to ensure that their assets, such as building and vehicle values, remain stable. This means that you cannot take risks with ministry opportunities that might damage what you have. Buildings can be viewed more like shrines to be protected than places into which all people are to be invited. Money must go to maintenance of what you have – membership, heating and air conditioning, tried and true programs and established patterns – rather than being risked for ministry within or beyond the walls of your buildings. One: It seems that many churches live in fear, like the third servant. Perhaps they are afraid to risk using what they have because they do not think there will be enough to go around. If they try a new venture in ministry, and it does not pan out, they think there are no do-overs. Too often they live in fear, just as I did so long ago as the new child in the neighborhood. They cannot risk losing – money, members, status in the eyes of our church-going neighbors – especially when times are tough, budgets are tight, and members are hard to come by. Two: And, they have come to measure success by achieving tangible things they can see, touch, and measure – members, numbers of worship services, budget totals. This leads them to hunker down and try to hold on to what they have just as the third servant buried the talent he was given. One: This story seems to have a harsh ending: the third servant is stripped of his talent and banished. Are we missing something? Two: Yes! Did you see the master’s response to the first two servants? The master invited them to “share in the joy of your master” after seeing the results of their risk taking. Joy! This is a parable about joy that comes from taking risks for the sake of the gospel and its ministry. One: And, it is a parable about abundance. One hundred years, forty years, or twenty years worth of wages provide enough money to allow for do-overs! The master has resources in abundance. Two: What would you invite the church to hear in this story? One: Rather than holding tightly to what we have – out of fear that we do not have enough money, people, time, or abilities – look to God, who gives to us in abundance and whose resources are without end. Recognize what God has given you, and then look to the world right at your door and see its needs. In what places do people need to know of God’s love, in what tangible ways do people need to experience the life-changing power of God’s Spirit? Open your eyes, and open your hearts. Then, risk using your resources – spend your money, use your building, leave your pews and venture into the world – to risk engaging in vital ministry. And, if it does not work out exactly as you had envisioned or hoped, use a do-over! Try again, again, and again! Two: And, then may you experience the “joy of your master!” Amen! This entry was posted in Sermons, Uncategorized on December 3, 2012 by Dean Allen.